Imperial Japanese Navy Nakajima B5N2 Type 99 attack bomber, tail code EII-307, part of IHN Zuikaku's second wave attack unit, over Hickam Field during the second wave of attacks at around 0910 Hours. USS Arizona (BB-39) burns in the background. Most sources disagree on the crew's names; the crew was probably Flyer First Class Masato Hatanaka (pilot), Petty Officer Second Class Hideichi Kamino (observer/bombardier/navigator), and Flyer First Class Kingoro Oizumi (radioman/gunner). This B5N2 was part of a three-plane formation led by Lieutenant Commander Shigekazu Shimazaki (September 9, 1909 - January 9, 1945) who commanded the fifty-four B5N2 attack bombers and 81 Aichi D3A Type 97 dive bombers of the second wave. The photo was taken by Warrant Officer Haruari Yaegashi, Shimazaki's other wingman. EII-307 was a last-minute transfer from IJN Kaga; her tail was left brown, and her new tail number was simply painted over. Shimazaki's B5N2s had either two 250-kilogram (550-pound) general purpose bombs or one 250-kilogram bomb and six 60-kilogram (132-pound) general purpose bombs. Hickam Field was extensively damaged in the attack; 139 were killed and 303 wounded. 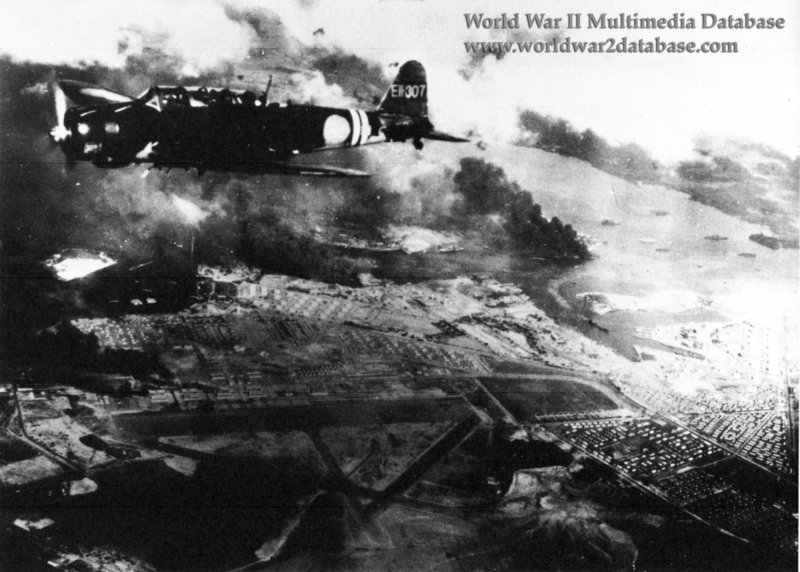 This image was heavily airbrushed by the Japanese government to remove identification markings from EII-307; also the background clouds were altered. This image was released worldwide with a caption praising the Japanese "Sea Eagles."